What’s My BAC? What to Consider Before Getting Behind the Wheel | Yavitch & Palmer Co., L.P.A. One eighth of a percent. That’s all your blood alcohol concentration (BAC) has to reach for you to be legally unfit to operate a vehicle. Not all beer has the same ABV (alcohol by volume). Even if you think you’re okay to drive after a few beers, depending on what beer it is, you may be over the legal limit. There is no standard for measuring the amount of alcohol in mixed drinks, as it’s solely up to the bartender’s discretion. Never assume you’re below the legal limit if you’ve had a few cocktails. Medicine can cause your BAC to spike. Even if you’ve only had a couple drinks, your BAC may be above the legal limit if you’re taking a medication. Your overall health and emotional state can also affect your BAC, so even if you’re used to having a few drinks without an issue, an oncoming cold or sudden change in mood can put you over the legal limit. Other factors that can affect BAC include age, gender, body fat percentage, metabolism, rate of consumption and alcohol tolerance. This is why thinking you’re okay to drive after drinking ‘just a few’ can still get you pulled over and charged with a DUI. There are a few ways you can monitor your alcohol intake to reduce the risk of reaching the 0.08 BAC limit. Remember, none of these methods are guaranteed, and regardless of the situation, you should never drink and drive. Common sense: If you know you’ve had too much to drink, or if you notice that you’re slurring your speech, disoriented or experiencing mood swings, do not drive. Find a designated driver or call a cab. One drink per hour: Limiting yourself to one drink per hour will typically keep you below a 0.08 BAC. Just remember that this method isn’t bulletproof, as alcohol concentration, hydration and a mixture of the factors mentioned above may tip your BAC over the legal limit. BAC charts: There are a ton of free BAC charts and calculators on the Internet, which take age, weight, gender and total number of drinks into consideration. However, these charts don’t account for your personal health, metabolism or alcohol tolerance. These generalizations and oversights might give you a skewed number when you’re trying to calculate your own BAC. 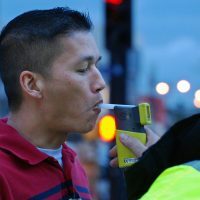 Portable breathalyzer: There are several commercially available, portable breathalyzers on the market. These are best way you can measure your BAC, as they’re actually taking a reading from your body and not just making assumptions based on general data. Keep in mind, however, that if you get pulled over for a DUI, stating that your personal breathalyzer indicated that you were below the legal limit probably won’t hold up in court. Once again, know that this article is not designed to give you tips on how to safely drink and drive. In fact, even if you’re below the legal limit of 0.08 percent BAC, you can still be pulled over and arrested if you’re driving recklessly and showing signs of intoxication. The only way to be 100 percent certain that you’re not over the legal limit is to simply not drink and drive. However, if you are pulled over and arrested for a DUI, contact one of Yavitch & Palmer’s specialized drunk driving lawyers. They will thoroughly investigate every detail of your case and work to get your drunk driving charges minimized, or completely dismissed. Call Yavitch & Palmer today at 614-224-6142 or use our contact form to schedule an appointment at our Downtown Columbus office to discuss your DUI/OVI charge.